I am so excited to announce my 1st vendor giveaway! 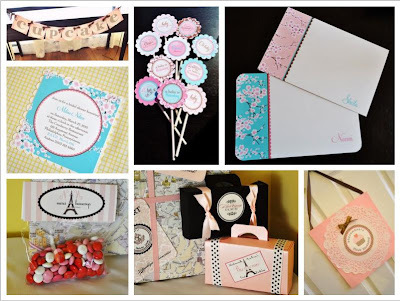 A little while ago, I won a gift certificate to Papercandee Shoppe - and I was so excited! But then I thought... Kim, you have access to so much - you should really give this to one of your Frosted Fans...soooo... I teamed up with the sweet owner, Dez from Papercandee Shoppe and we are giving YOU the chance to win instead! Princess Collection - How adorable is this!? 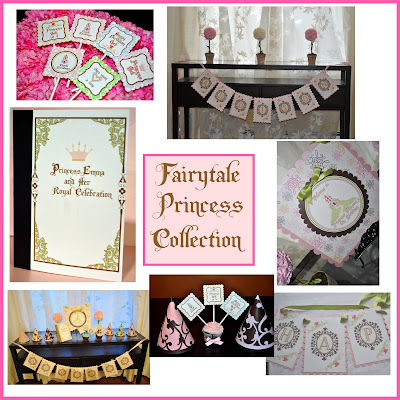 It's whimsical and fun - every element of this collection is ornate and reminiscent of the elements that your little princess loves from her favorite princess stories and movies! Perfect for a princess or princess and the frog party! Cupcake Lace: Drawing inspiration from Martha Stewart and her love for doilies, it turns out cupcakes match perfectly with lace! Cupcake toppers embellished with paper 'lace' is also available, along with a party banner and door sign that are made of 'lace' as well! Parisian Affair: Why not make a splash at the start with a Parisian invitation that is like no other? Available in multiple designs. Also available: door sign, party banner, favor stickers, bag toppers, newly designed cupcake toppers (in addition to the original collection) luggage tags, and soon-to-come: a suitcase favor box that you can also use to accent your dessert or favor table! "I Heart Cherry Blossoms": Finally, Spring has sprung! Originally created for Mother's Day, this collection is also perfect for any event! From weddings to showers and birthdays, life's events are always best represented with the sweet blossom of flowers. Why not surprise your loved one with a beautiful set of matching stationery and cupcake toppers to sweeten her day? Important: Leave an email where you can be reached if you are the winner! Ends: Giveaway entry will end 5pm next Friday, April 9th. The winner will be chosen by entering comments into Random.org - make sure to check back for the discount if you aren't the lucky winner! Thanks everyone for following Frost Me! and all your sweet comments! Good luck!